HF replaced my light with DOT approved LED units. The tires on mine were not on the recall, but those that were are replaced for free. HF just resumed selling the trailers again. I took the HF straps back and bought SmartStraps that I really like. So far, two trips and she has held in well. I can even load/unload by myself now. First was about 90 miles (180 total), second 20 (40 total). First included ~25 miles I-75 construction rough road @ 60-65mph there and back. Bike (~600+ lb GoldWing GL1000) rode steady the whole time. Won't say I didn't feel it back there as the tire pressure may still be a bit high and it causes a bit of bouncing (pulled behind a 2001 S-10 4x4 four door). If the Equinox is a V6 it should do fine. We have a 2.4liter 4 AWD and I wouldn't attempt it with that. BTW, a jackass pulled from a side road blocking the 2 lanes in my direction yesterday with a big long bed crew cab dually. I got on the binders hard enough to kick in the ABS (sucky on these trucks) and steered for what I hoped would be an opening in the other lane as he wandered into the median and I just slipped past his rear bumper. Bike and trailer didn't seem to notice, and didn't effect my maneuvering. Yeah, ours is the 4 cyl front wheel drive, but does have the factory mounted 2"reciever. I'm thinking it has a 1000lb. towing capacity. 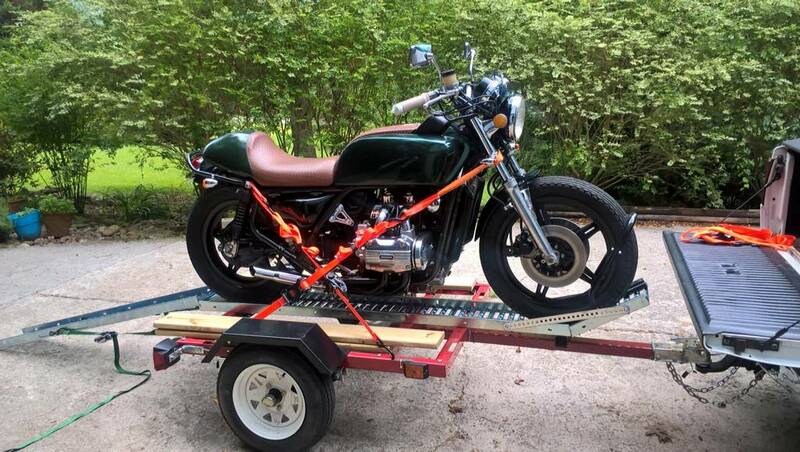 The dr650 weighs a bit under 400lbs wet, and I'd guess the trailer would be under 200 lbs? Must be under 200, even with the ramp added. I put an el-cheapo chock on the front and an angle set just behind the front wheel to give it a bump that holds it in the chock when I get off. The deck boards are at a width such that I can put the kick stand down and climb off easily, then tie it down. I also put the axles on top of the springs instead of under. This lowers the trailer making it easier for load/unload. Moved the tongue and mid rail forward one hole (of the pre-drilled, but I drilled a couple more) to make sure I had 60/40 weight distribution without moving the bike and rail too far forward. To find the center point of the bike, I put one of the ramps on a pipe and rolled the bike on it until it pivoted. Turn out that is right under the stock footpegs. The rails are the cheapest HF steel rails. I haven't done any welding on it yet, but might weld a few joints this fall. I bought the trailer in 2014 on sale, but don't remember what I paid. I think the rails were $59.99 with 20% off and the chock was $16 on Amazon. About $10 worth of bolts and around $16 for the 5/4 x 6" deck boards. BTW, I washed out the chicken fat from the wheel bearings and repacked them with grease I had around for a boat trailer. They run cool so far. This is how I strap it now, with one more from a soft strap around lower triple/fork, under the frame and back to another soft strap around the other lower triple/fork joint.